Amid an undeclared arms race among European defense contractors to reequip Libya’s armed forces, Britain is sending a Royal Navy war ship to Tripoli to act as a floating show room for security firms. 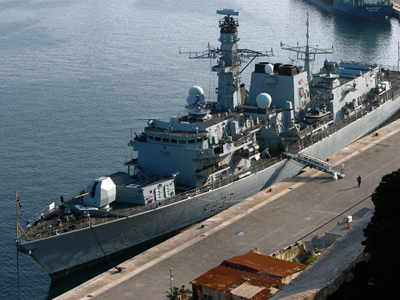 A British government agency, UK Trade and Investment (UKTI), is organizing an arms fair on a Royal Navy frigate, which will dock in Tripoli, Libya at the beginning of April. UKTI has so far refused to disclose exactly what businesses will be there and what gear they will be showcasing. “There is a scramble among European arms firms to sell to Libya with the Italians and French leading the way. In 2001 before the imposition of the arms embargo, EU countries had approved licenses to Libya worth 34 million euro,” Kaye Stearman, Media Co-ordinator for the Campaign Against Arms Trade (CAAT) told RT. UKTI describes the event on its website as “an opportunity for UK defense and security to promote equipment and services to the Libyan navy aboard a Royal Navy vessel in Tripoli” and that it hoped to “attract key senior military personal from the Libyan government”. A UN arms embargo is still in place and with the UK Foreign Office describing Libya as a “country of concern” with regard to its human rights abuses; Britain is restricted in terms of what it can sell. Sir John Stanley, who chairs the committees of arms export control, has said he expects the government to adhere to the criteria of arms export licenses. 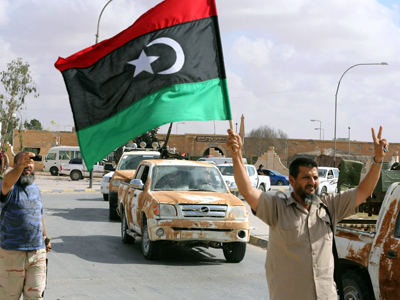 UKTI has said that no weapons will be offered for sale and the Libyans will be offered specialist equipment for port security, such as inflatable dinghies or uniforms. However, Stearman believes that the sale of arms is the ultimate priority of the event. “When an arms company takes part in an arms fair or exhibition, it is with the expectation of sales, and it is hard to believe that the only equipment on sale will relate to security,” she said. The exhibition appears to be part of a wider policy by the UK government of a strategy to foster relations with countries where Britain has security and business interests. In the past the UKTO listed Libya as a “priority market” for UK arms sales, which were openly sold to Gaddafi’s regime before the uprising against him. There was also a Libyan delegation at the Farnborough Air Show in July 2012, which showcased British aerospace defense equipment such as the Typhoon fighter jet. Speaking at the Farnborough airshow last year Chris Baker, the operations director of UKTI’s defense arm, said the UKTI was looking at Libya’s border and maritime security and “at rebuilding their defense infrastructure” and “getting their air force back on its feet from scratch”. By March 2011 British companies had won £62 million ($95.8 million) worth of arms exports to Gaddafi since the arms embargo on Libya was lifted in October 2004. 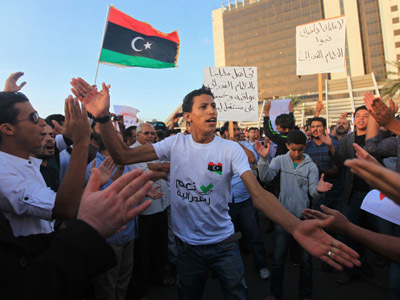 Since the fall of Gaddafi, Britain has also offered to train Libya’s army and police. 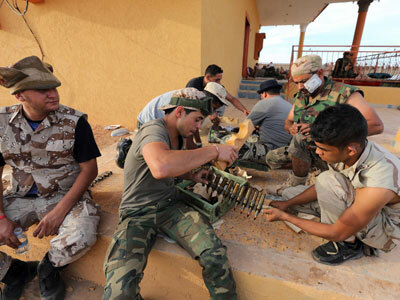 But prominent Libyans have raised concerns that the race to win defense contract could end up with weapons falling into the wrong hands, in a country which is already awash with weapons and where security is a major issue. “I can’t see the point in having this kind of exhibition in Libya now. One of our problems is that there are arms everywhere,” Hassan el-Amin, who is chair of the congress communications committee, and lived in Britain for 28 years, told the Guardian. Barry Gardiner, Labour MP for Brent North, said he was not against Britain having a strong arms industry, which exports worldwide, but questioned the timing of the fair and was saddened by the UKTI attempting to establish a relationship with a country in terms of arms when Britain has so many other things for sale. “I think it is deeply regrettable that the first thing the UK should be trying to export to a country recovering from a conflict situation is arms. It would be much better if we were offering them support in other ways such as helping to rebuild their infrastructure,” Gardiner told RT. Stearman also voiced concern that the UKTI has not released a date for the exhibition or said which companies will be attending and said that “part of the reason for the lack of information about this event, is that the government would be embarrassed by a more high profile event”. A survey carried out by the Sunday Times in 2011found that 77% of the British public felt it was wrong to sell arms to Gaddafi’s regime. 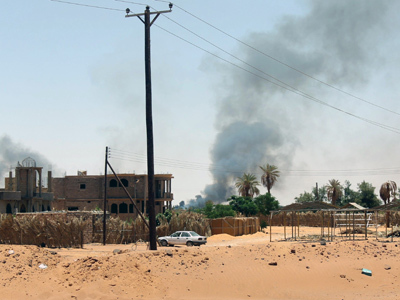 “What is needed in Libya are efforts to demilitarize and invest in civil infrastructure,” said Stearman.